"Scouts who come to Many Point will still participate in some of the traditional activities like swimming, canoeing, rowing, orienteering, lashing and shooting. Yet they will also have a chance to participate in some of the more recent innovations. We now have a huge fleet of Sunfish sailboats, six climbing towers, ATV training programs, several 25′ aqua trampolines, two Huck Finn rafts, Jet Ski’s, kayaks and two tree house villages. In addition to a variety of programs, troops also have the choice to camp in one of fifty campsites split among four sub-camps. Although each sub-camp offers the same great program, each differs by the style of meals provided. Buckskin has a full service dining hall, Ten Chiefs offers a combination of patrol cooking and heater stacks, Voyageur troops cook food provided by the commissary and Pioneer troops can choose a commissary option or provide their own food. Scouters can also bring their families to stay in one of twenty cabins and participate in the fully-staffed program at our Family Camp. 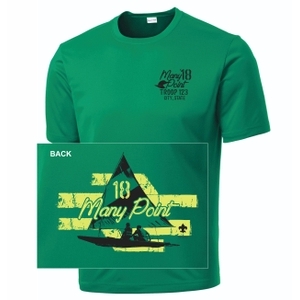 Many Point Scout Camp is a week-long summer camp that usually takes place in Late July to Early August. 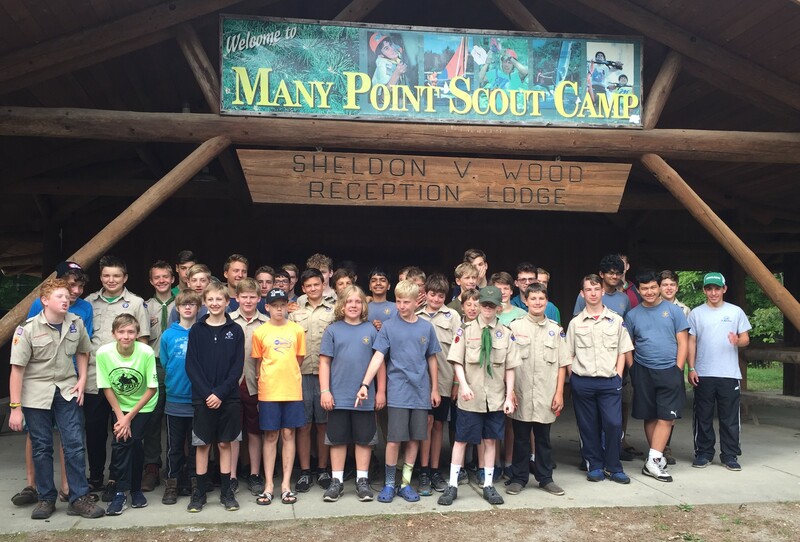 Below is all the information you need to know and complete as your prepare for a great time at Many Point Scout Camp. Please contact Mr. Lebakken (email) with questions. Planning Meeting Agenda - this is the formal agenda for the planning meeting. Planning Meeting will take place on TBD. The pre-camp swim test has been scheduled for TBD at the Southdale YMCA. Scouts with last name A-L start at 7:00 p.m., and scouts with last names M-Z start at 7:15 p.m. Meet on the pool deck. Required for all scouts and adults to participate in aquatic activities. If you can't make this date, you can take the test at the Many Point beach on the day of arrival or have the swim test form signed by a lifeguard, swim coach, or swim instructor. Tier 3 High Adventure - week long programs for scouts going into 9th grade and above. RSVP by April 12. Health Form - required for all scouts and parents, adults only need physical if staying longer than 72 hours. Equipment list - official list from Many Point. Hoigaards is offering 15% to scouts for camping equipment. Contact Mr. Lebakken for details. Class B Uniforms will be available to purchase for $15 departure. Sizes are limited if you didn't order ahead. Medications can be stored in the Troop lockbox. Bring medications along with a completed Medication Record Form to the drop off on Sunday morning. Don't forget to drop off your FAT TIRED bike on Saturday at Liethen residence - 4832 Townes Rd, Edina, MN. Drop off time: Saturday 7/28 from 1:00 pm to 3:00 pm. Bikes will not be accepted after 3:00 pm Saturday. Bikes must be in good running order including working brakes. Volunteers for loading needed at 3:00 p.m. Saturday. NOTE: Helmets are required for all scouts/adults riding bikes. Label it and bring with your gear (don't leave with bike). Many Point offers a very diverse set of activities. For those who love the camp, one of those is becoming a Counselor in Training (or CIT) and staying at Many Point for 5 straight weeks during the summer. You must be at least 15 years old (In some cases, they allow you to be 14 and completed 9th grade) to qualify. Being a CIT costs $100 for the entire 5 weeks, (which is actually cheaper than not going (35 days * 3 meals a day $1 each = $105)) participants can earn their BSA Lifeguard, as well as every merit badge and award given at Many Point, and Many Point gives out Scholarships to active CIT's. More information is here (Bottom half of the link). Q: What is location / time of departure? Q: What is the location / time of return? Arrive on Saturday, August 4th at approximately 2:30 PM at the CPC parking lot. Expect a call from your Scout 30 minutes prior to return. Actual return time will vary depending on our check-out process and travel time. Q: Do I need to bring a tent ground cloth per the packing list instructions? No, tarps are not needed. Troop will provide. Q: Who should I thank for all the coordination activities?